ANTHERUS, the nineteenth Pope of Rome, St. Anthers served for only forty-three days (21st November, 235 — 3rd January, 236 before he was martyred. He was buried in the Catacomb of Pope St. Kallistos I (14th October) one of the Catacombs of Rome on the Appian Way. During his brief pontificate, St. Antherus began the practice of saving documents relating to the early martyrs, which in time grew into the Vatican library. BERTILIA, a noblewoman, who even in youth was noted for her piety and charity. Following the death of her husband, St. Bertilia lived as an anchoress near the church of Saint Amandus of Maastricht, at Maroeuil (Marolles) in Flanders, which she had previously founded. St. Bertilia reposed circa 687. 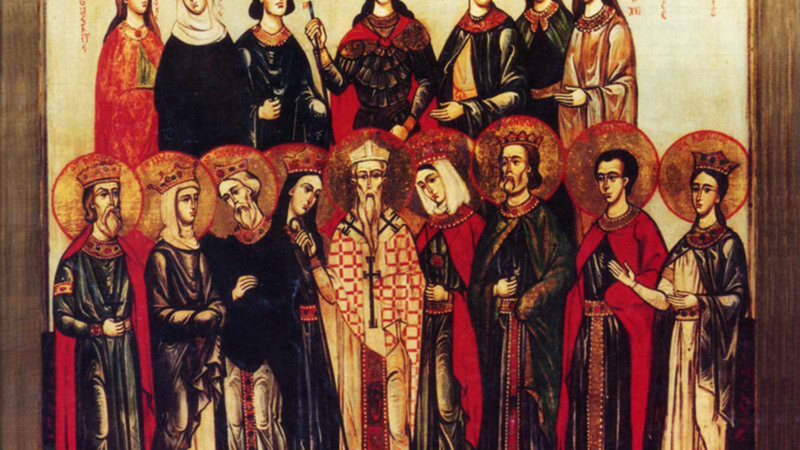 BLITMUND, a monk and disciple of St. Attalas (10th March) at Bobbio. St. Blitmund accompanied St. Valéry (1st April) to Picardy where they founded an abbey at present-day Saint-Valery-sur-Somme, France, later called abbaye Saint-Valery. St. Blitmund later served as its Abbot. He reposed circa 660. DANIEL, a deacon to St. Prosdocimus (7th November), the first Bishop of Padua. He was either a convert from Judaism or of Jewish ancestry. St. Daniel was martyred for spreading the gospel in 168. FINLUGH (FINLAG), (Sixth Century), a brother of St. Fintan ( vide infra), St. Finlugh left his native Ireland. He travelled to Scotland where it is thought he became a disciple of St. Columba of Iona (9th June). He later returned to Ireland to serve as abbot of a monastery founded by St. Columba of Iona in Co. Derry. FINTAN, (Sixth Century), a brother of St. Finlugh (vide supra), and disciple of St. Comgall (10th May) at Bangor. St. Fintan is the patron saint of Doon in Ireland where his holy well still exists. FLORENTIUS of VIENNE, (Third Century), an early Bishop of Vienne, renowned for his holiness of life and erudition. St. Florentius was exiled and martyred for the Faith, circa 253. 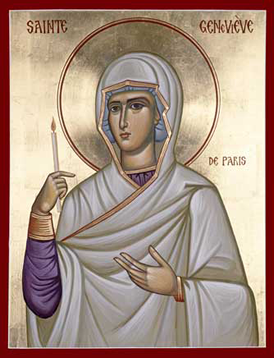 GENEVIÈVE, as a child St. Geneviève met St. Germanus of Auxerre (31st July) who foretold her future sanctity, and at the age of fifteen, she received monastic tonsure. St. Geneviève had the gift of clairvoyance, which at times led many around her to persecute her until the Bishop of Paris came to her defence. When Paris was under attack by the Franks and later by Attila and the Huns, St. Geneviève encouraged those defending the city, and organised groups to pray for God’s protection. St. Geneviève reposed in 500, and ever since has been considered the special protectress and patroness of Paris. WENOG, (Date Unknown), an early Welsh saint about whom there is no information extant.